Business Rocks 2017 has been cancelled after the company behind the event went into liquidation. The May event was rendered 'unsustainable' after commercial partnerships and visitor numbers fell significantly below expectations. Majority shareholder Scott Fletcher, who had invested £250,000 in last year's event, placed the company into liquidation. 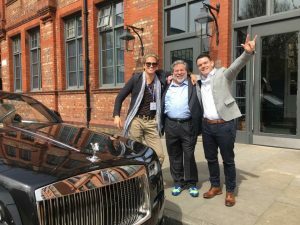 Former recruitment consultant Jonny Cadden, who set up the firm, secured Apple co-founder Steve Wozniak as keynote speaker for last year's event at Manchester Central. But Fletcher, the CEO of ANS, told Prolific North: "I invested to support Manchester at the time, as Cadden had secured Steve Wozniak and I didn't want the city to have egg on its face. "Manchester has moved on and there is more happening now. I am not in the events business and anticipated other investors coming along, but this did not materialise." Cadden added: “I am hugely disappointed to announce the cancellation of Business Rocks 2017. I have put my everything into this vision for the last three years but regrettably have had to accept that my everything is not going to be enough and can confirm that the company is now in the process of being placed into liquidation." Prolific North is awaiting an update from the liquidator Richard Cole at RSM for information on the creditors and suppliers and amounts owed but we understand all salaries were paid before the liquidation was called.